Experience the Columbia River the right way! With Dwayne D'Andrea, and Mountain Valley Sports Fishing & Tours. We are a West Kootenay fly fishing guide company established back in the early 90's, and proud to say the first fly fishing company located in Southern British Columbia that specializes on the Columbia and Slocan rivers. Unlike many of our competitors, our guides grew up on these waters, and currently live in the immediate area. 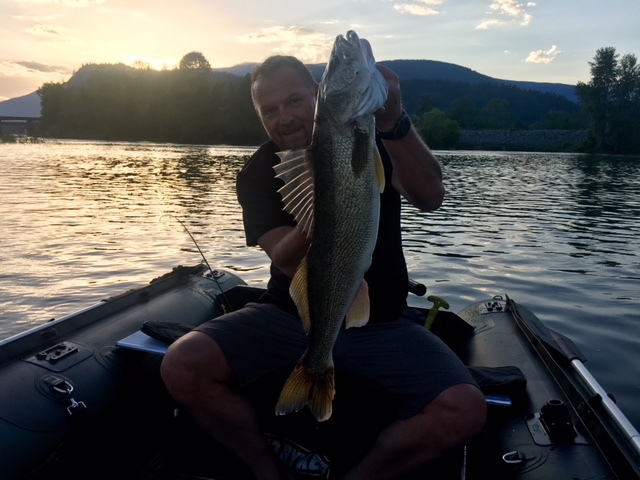 The "Mighty" Columbia has earned that reputation for a reason, and with Mountain Valley Sports Fishing and Tours, you can fish with confidence, knowing safety is our #1 concern. When booking a fishing trip, always ask if the water you are fishing is the home waters of the guide company that you will be booking with. Rainbow trout are the main species we target. The Columbia is teeming with them, providing awesome action throughout the season. Whether they're sipping dry flies from the surface or cruising deep within the fast moving currents, we have the flies, locations and knowledge to hook into these beautiful fish. If you haven't tried fly fishing for Walleye, you should. It's a lot of fun and can be more productive than spin fishing with the jig. We use special patterns and heavy lines on 8 wt. rods to target these great eating fish. The Columbia River near Castlegar produces many Walleye over 8 pounds and the limit here is currently 16 fish per person, per day - any size. You will be guided to the most productive hole via a Walleye tournament style Lund boat, equipped with a 130HP motor to get you up and down the river to the best holes. Walleye fishing on the fly is a great add-on to your trip. The original Dwayne D’Andrea Carpet Caddis - Often copied but never perfected. This pattern, developed by Dwayne, is a must-have when fishing the Columbia during the dry fly season. This fly can be purchased before your trip for $2/fly. "Mountain Valley Sports Fishing and Tours meets or exceed all safety standards, so our clients can focus on what is important... the fishing!" Available only in July and early August, this trip tests your skills against the hungry, aggressive trophy rainbows who feast on the intense caddis hatches during the late afternoon and evening, during these summer months. "Sport Fishing on the Fly".